Frankly, it made me chuckle and roll my eyes. My dad is a loving guy, but blunt and pretty rude. He shoots his mouth off all the time. Luckily for him, my husband wasn’t around because he would have hit the roof. I let my dad vent a little about the inconvenience of my son’s, and now my, diet. I was visiting him and we were driving somewhere. Then I started talking. I had to remind my dad that his grandson was having chronic diarrhea. I remember thinking last fall, “How exactly does one toilet train a two-year-old who never has a solid poo?” I was at the end of my rope. I had my son tested for allergies (lots of foods including milk but not wheat — huge regret now that he’s gluten free and accurate testing would require him to go back on gluten). Anyway, nothing came up last fall. Also my son couldn’t breathe. My son was prescribed a daily steroid and we received an at-home nebulizer. I was heartbroken. But I wasn’t ready to give up. I pulled my son off all cow’s dairy products (he was already drinking goat milk) and then in October I pulled him off all gluten and wheat products. It was a last ditch effort. And it worked. This past winter, my son was still sick randomly, but we went weeks without illness — virtually a miracle. I had to remind my dad that just coincidentally after the little guy went gluten free, my son went through a pretty significant growth spurt. He’s thin, but he is quite tall for his age now. Also since my son isn’t having so much trouble with his tummy, he rarely tantrums. Terrible twos? He’s basically an angel. Oh yeah, my son is toilet-trained now too! Woot! My dad shut up right away. 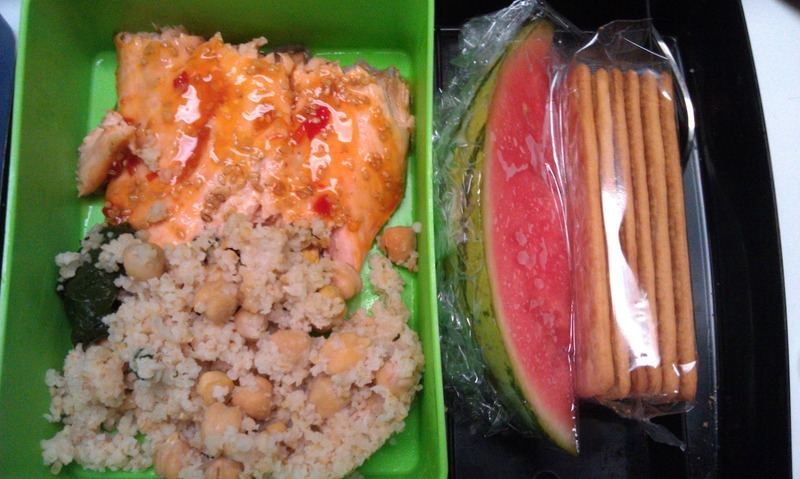 Lunch pictures after the break…. The crunchy green beans are from Trader Joe’s. Basically they are like veggie chips. I’d love to try my hand at making them at home. And the story behind the blueberries in the yogurt? Last weekend I made pancakes and then realized we had run out of syrup. So I searched the cabinets and found a can of blueberries for making a pie. We poured the blueberries over the pancakes and they were divine. Then I thought blueberries would liven up regular yogurt. 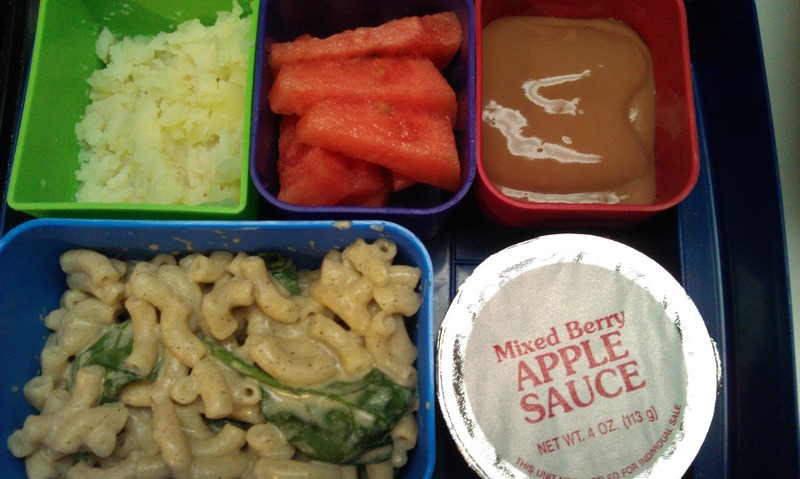 Day care menu: Cheese ravioli, bread, diced pears, green beans with yogurt and fruit for snacks. My son saw watermelons at Whole Foods and so we left with one. He was thrilled. I put the jello in there because the other kids were getting ice cream. 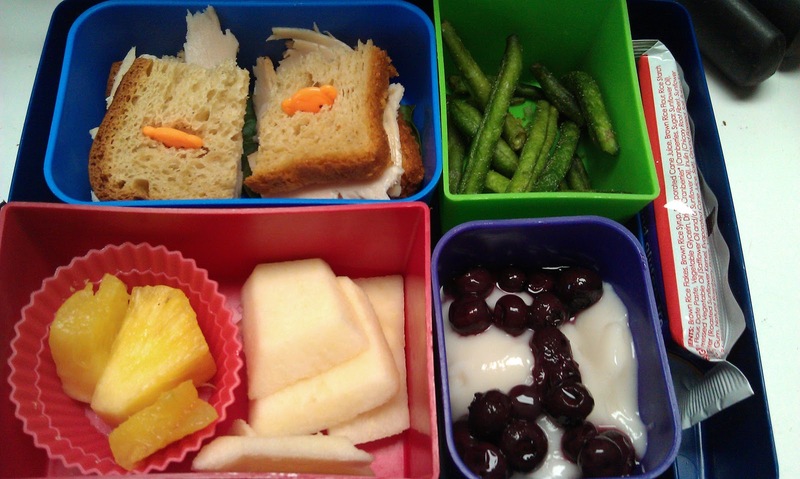 Day care menu: American cheese sandwich, tomato soup, mandarin oranges, peas with fruit and ice cream as snacks. The other kids were getting mashed potatoes so I sent some for him. 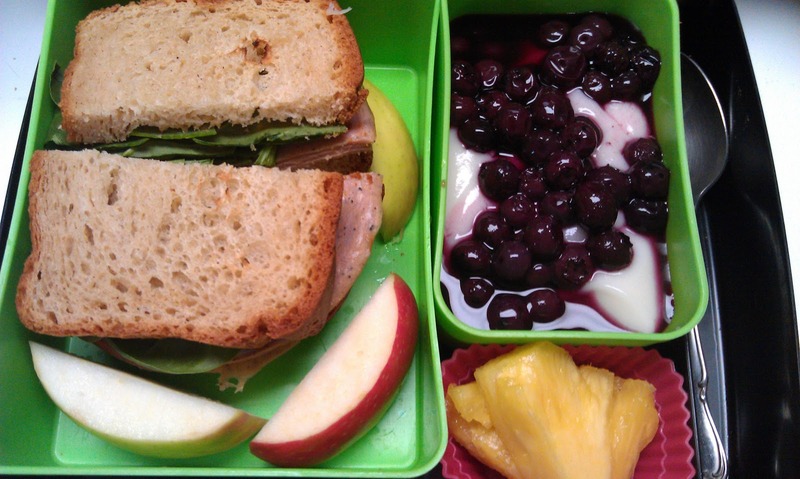 Day care menu: Diced ham, mashed potatoes, applesauce, green beans with fruit and yogurt as snacks. Written on our daily summary form: “He cleaned his plate!” Everything was a finger food (aside from the yogurt), which might have helped. Day care menu: Ground beef with pasta in cheese sauce, bread, diced pears, diced carrots with fruit and yogurt as snacks. The yogurt was divine. Like eating blueberry pie. Swoon. I’ve decided that even people like me who aren’t big salad people can still enjoy a salad. It just has to be small and loaded with my favorite things. I put on cranberries and maybe even pecans. I don’t remember. Leftovers! 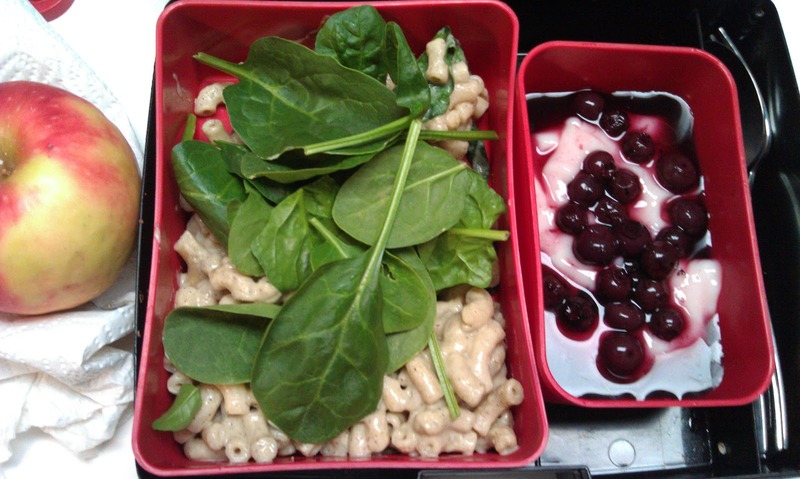 Most of the spinach was gone at dinner so there wasn’t much left for my lunch. Meatless Thursday? I made the mac and “chreese” with goat milk and I didn’t have an adverse reaction. Yeah, maybe I’m healing! 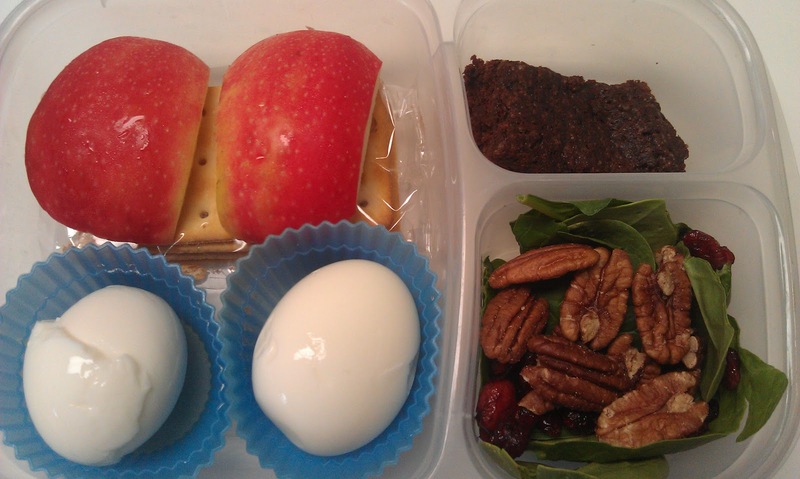 Eggs, crackers, apples, mini-salad and a brownie! Yes, even I have to eat brownies every now and then. And I think that I’m not having trouble with chocolate anymore. It really has to be gluten free though. I made the brownies from a package (Bob’s Red Mill) and instead of butter I used coconut oil (at room temperature it’s solid and white). Delish! The 13 by 9 pan was gone within 72 hours! My brother's son was so sick from gluten that he was having hallucinations. It's not a fad; it's good child care. Out of curiousity, do y'all have trouble getting your kid to eat so much unsweetened yogurt? Although he's wrong in this case, I like that your father appreciates tradition. A lot of the hype about mediating and purifying what we put into our body IS hype from fad nonsense. The healthiest people I know eat fake, packaged, or otherwise "bad" foods. I don't think there has been a time in history when people have been so obsessed with what they eat. But at the same time, we have learned a lot about legitimate diet concerns, such as gluten-sensitivity. I think the extremes could learn from each other. Oh wait…it's chocolate. 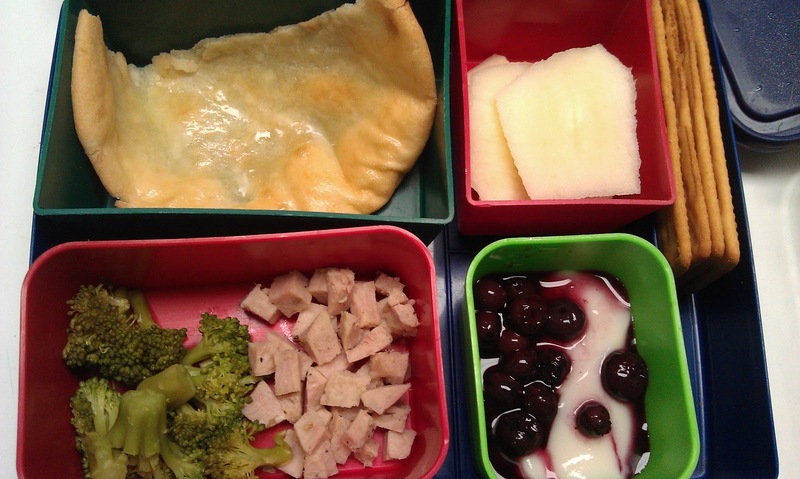 Ok, I love this blog and I truly support and cheer on the work you're doing to try to get kids better and healthier food in schools. You've really become a very influential voice, and that's so wonderfull! That's why it confuses me when issues like fights about chocolate milk come up. I know not everybody likes it but… what's the difference between chocolate milk (a sweetened dairy product) and chocolate/sweet yogurt (a sweetened dairy product)? Or pie filling? Why is one dose of sugar to "jazz things up" ok, but others not? Where's the line, and if it really is just a matter of personal preference, why do people try to get one banned, but cheerfully support the other? Swear that I'm not trying to cause any trouble here, just concerned about the important thngs getting lost in fights about personal preferences. Actually, I'm the one who has trouble eating unsweetened yogurt. I had an open can of berries that I didn't want to waste and it was an opportunity to use them up. The berries did the trick for me — I enjoyed the yogurt a lot. I'm one of those rare parents who doesn't care if my son eats or doesn't. I have the luxury of having a healthy son – I know that's not everyone's reality. But if he doesn't eat yogurt one day, I don't care. I don't have to worry about him eating a certain number of calories per day to gain or maintain his weight. However, I find myself trying to compete with daycare food. They can give the kids whatever, but I have to make sure my kid doesn't want what they have. I don't care if he doesn't eat my stuff; I just don't want him eating their junk and feeling left out that he can't eat that. Although that seems not to be the case, many readers have warned me that that day will come. The chocolate milk at school is separate because it is a special treat, not a daily requirement. I'm not giving my son chocolate yogurt every day. Yes, he did have a fair amount of sugar this week. It just turned out that way.
" I'm not doing this because it's fun "
Casein and Gluten free diets are becoming more popular as more people are seeing differences in children with autism and behavior issues. Two of the student I work with right now are C/G free. I know one parent of a child with schizo-affective disorder who went Gluten Free and her son's hallucinations stopped. We are learning more and more how these things can effect us and I think it's on the rise with all the manipulation that has gone on in our produce. I think you made some great points when talking to your dad. This is NOT just a fad but good parenting to help your child grow healthy and calm. Keep up the good work! As for the chocolate milk issue, it would be one thing if it was an occasional treat like pie or other sweet treat but when it is daily ingested, there is a problem. I see so many kids who are overweight who consistently drink one or two cartons of chocolate meal EVERY day. Seriously, why shouldn't we teach them good boundaries as far as sweets are concerned? I love crunchy green beans! Who knew they could be so delicious?! Have you ever tried using ghee? It's clarified butter, but is casein (and lactose) free. We use this and coconut oil in our casein-free house, and it's wonderful. We sweeten plain yogurt by blending it (in the blender) with honey and fruit. It tastes fantastic. 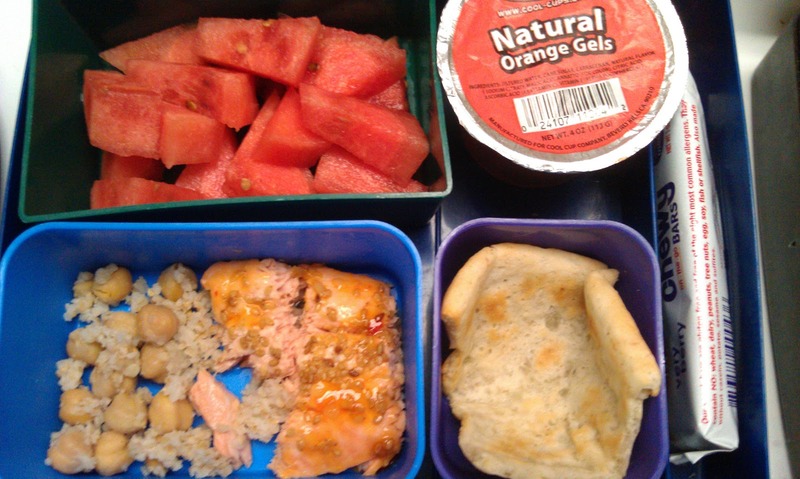 Thanks for sharing the great lunches! Yeah, there is a generational resistance to believing in things like food allergies, autism, "sensory issues". Within the past year, I have learned that 3 of my friends' children have something called "sensory issues"; while I believe it may be a real condition, I certainly would not be able to explain any of it to an old timer in a way that wouldn't make their eyes roll. I do feel sympathy though; before I had children I thought all those food allergies were just neurotic parents gone silly. Then I had my son and he turned out to have 6 food allergies, 2 of which were probably margin of error (soy and rye), 2 of which were real but that he's since grown out of (egg and wheat), and the 2 others (shellfish and nuts) require the Epipen and an ER visit in cases of accidental ingestion, which has happened a couple of times at a neighbor's house (nuts). My parents are old, and they had a really hard time believing that my toddler's allergies were real until they fed him pizza while babysitting, despite having been fully and explicitly briefed on what he was allergic to. ("Really? Pizza has wheat in it?" my father THE DOCTOR said as my son's eyes swelled shut and I fumbled for the Benadryl.) Yeah, they still send the kids care packages with chocolate treats containing HAZELNUTs. Sigh. But the upside is that my son, who is now 9, is extremely cautious about eating food that he hasn't read the ingredient label for, and he knows that even well-meaning friends and parents who are aware of his allergies can be dead wrong about what's in a cookie. I think you're doing an absolutely amazing job as both a daughter AND a parent (and I'm sure as a wife and teacher, too!). As a doctor who has been out of med school less than 20 years, let me tell ya- I got almost no nutrition education. Our economy and society place such a huge emphasis on selling/adding things to us, and it is a huge problem in medicine today. To put it cynically, there's a lot more money being invested in selling us antihistamines than in the idea that perhaps we should eat less dairy (or whatever). And as for the generational issue: People in older generations were not exposed to as many plastics, pesticides/fungicides/herbicides, and just plain old industrialization/chemicalization of food. So it IS strange to many of them that our children (and we) are having diet related problems. The human body hasn't really changed that much but our food supply really has. I think we'd all really rather be doing something else with our time and energy, but if we don't speak up about these issues when we see and experience them, big pharma will own us. It's definitely true that some kids have allergies and can't digest some foods, but at the same time, there are crazy parents out there forcing their kids on diets. The vegan couple who inadvertently starved their child comes to mind. NOT that I'm saying you're putting your child on an unnecessary diet. I just think it is a valid issue to be concerned about. my parents came to visit and asked the same question again "you don't have allergies and your husband doesn't have allerigies, so why does your son have them?" makes me crazy that she asks this Q every time we see them. You are doing what's best for you & your son and No it is not easy to do and plan etc. It's a lot of work. LOVED that your father called you out on your own BS. Sometimes your snotty, I know it all and no one can tell me otherwise attitude really grates. Wow, Connecticut. I would say the seasoned cast iron skillet is calling the shiny silver aluminum baking sheet black. Son's preschool classmate was an active, slim, otherwise healthy child with a nervous tic that worsened to the point that his parents got scared and brought him to see a specialist. Specialist asked dietary questions. Turned out the kid's weekly milk intake was easily several gallons. Specialist said, cut out the milk completely. The tic disappeared so fast it astounded everyone, including the specialist. Now the kid can drink milk but nowhere near the same quantities as before. so why do you read this blog Connecticut? I've seen plenty of kids with real allergies. We found out my brother was allergic to cherries the hard way: A trip to the ER after we spent the day picking cherries at an orchard. He started to get swollen, had a hard time breathing, developed this godawful rash on his face and hands. I've also seen plenty of people pointlessly neurotic about making sure NO processed anything goes into food. Processed food with stuff in it is not new; the meat industry has used additives (some of them pretty freaking nasty) since at least the late 1800s. Hi. I definitely think the place to start is the food. If you can cure things with diet, that would be ideal. We tried, and then after two to three years of our son suffering from constant illness-all starting from the nose, then going to the ears and then leading to chronic sleep apnea, snoring and bronchitis, an ENT said his adenoids were huge and preventing things from draining. Fearfully, we decided to follow our doctor's recommendation to have them removed (along with his tonsils, which I wasn't sure about) and have ear tubes put in to drain the mucus. It was a painful week and a half afterwards, but even during that time, he was suddenly without the dark circles under his eyes, without the constant flow of mucus out of the nose, without the coughing and everything that he had been dealing with. He looked clear, and his coloring improved. He is breathing through is nose when he reads, no longer mouth breathing and snoring when awake and concentrating on something. Could you post the brownie recipe with coconut milk? Thanks! a young college educated adult who is employed in a well paying profession and who lives or works near a large city). The fad diet part – that is a little bit more difficult. After reading your blog and hearing friends switch to a GF diet I have become interested and read about it. It often seems to me that by eliminating processed foods that contain gluten you also eliminate so many other additives that can be causing allergies. I think a lot of people benefit from these diets but the scientific reason (gluten v. additives v. god knows what processed foods contain) is not easy to find out. And sure, people who didn't grow up with these things find it difficult to understand why one would eat coconut milk and chicken sausage (imo that is "fad"). 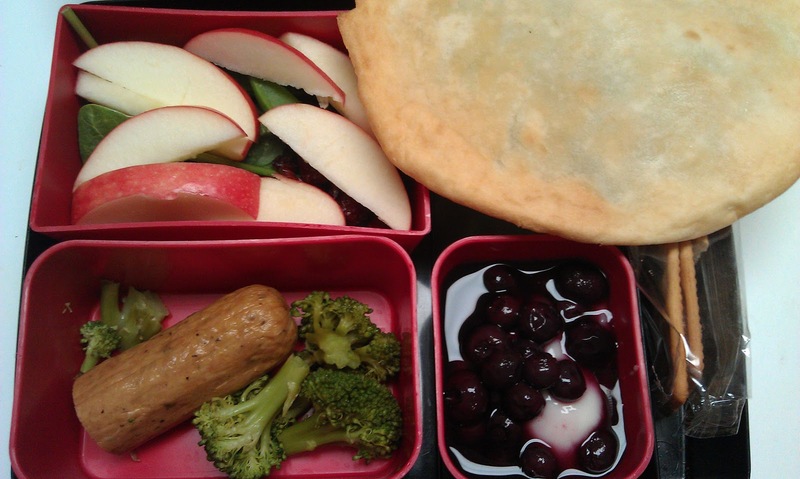 I sometime think you spend too much time talking about your gf issues (a problem that applies to a limited group) versus your "main" issue – healthy school lunch and the interest in healthy eating. As a general audience person I find the latter more interesting and a lot less preachy than the former and the main reason I take the time to read this blog. I'm amused at the several "You're writing your blog NOT THE WAY I WANT YOU TO!" comments. Good grief. It's your blog. 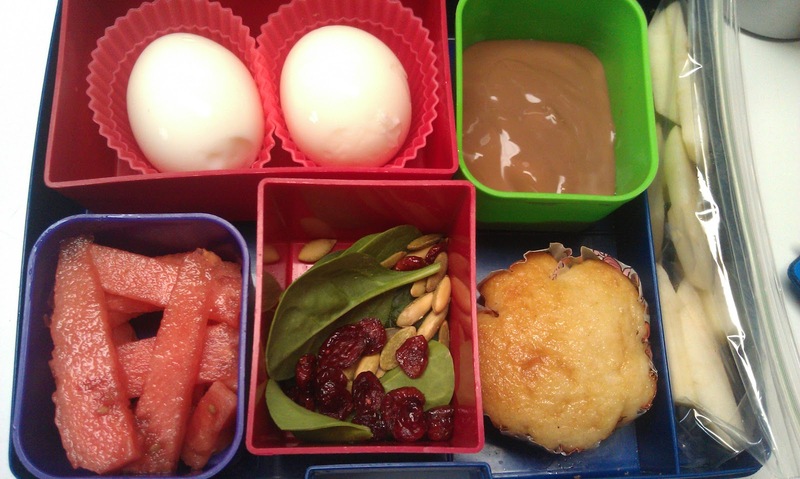 You have your own dietary issues, and so does your son. It's not like we're paying for the privilege of reading your articles: we get them for free. So don't feel like you must pander. Write what you write. Most of us have developed some skills at gleaning information that's relevant to us from any well-written article. Don't sweat the picky people. No doubt. Not to mention the folks who think that gluten free doesn't apply to them are mistaken. Grains are a problem for humans, all humans, and always have been to varying degrees. In the past half century we began genetically modifying our wheat, taking it from 7% gluten to 50%. This is why so many are so sick with autoimmune diseases, heart problems, and cancer. I've been 100% gluten free for a year and am off my thyroid meds and no longer suffer from depression among many other things. I could tell you 18 other similar stories of people I personally know who got off this poison for the better. This isn't a fad, its a revelation and an absolute miracle to those willing to stop being so bull-headed about what they think they know and take a closer look at it. Your stubbornness is really only hurting yourself and your loved ones. Beyond the greater societal good I have no ball in that game. Ah yes and Tanya, I cut out preservatives, sugar and things I couldn't pronounce for one year before going Gluten Free so I have an answer to your question about additives, at least in my case. I saw a huge improvement in my health and energy during that time but nothing close to when I cut out gluten a year later. I still had Depression, join problems, insomnia, night blindness, hypo-thyroid and a host of other issues even as I felt better then I had. It wasn't until gluten went that I got my life back and felt like me for the first time in 30 years.